FIVE YEARS AGO, HEIGHTS RESIDENT JONATHAN WELD, chairman of the Evergreens Cemetery, decided with the other six members of the board that it was time to increase the cemetery’s public profile. One of those members, botanic artist and Heights resident FRAN ANDERSON, was, according to Weld, instrumental in the process of creating the beautiful coffee table book on Evergreens’ 160-year history released last month by the cemetery. Set in Bushwick, equally straddling the Brooklyn-Queens border, the little-known Evergreens has largely been eclipsed by Green-Wood, although it carries an equal share of Brooklyn and New York history. Walt Whitman buried both of his parents there, although they have since been moved to rest with their son in the family mausoleum in Camden, NJ. Other residents include soldiers, the victims of several devastating fires and epidemics, and many Chinese, crooks and actors (believe it or not) who weren’t welcome in other burial sites at the time. Late last year it was named to both the State and National Register of Historic Places. “We wanted it to be not only a coffee table book, but a serious scholarly book that would be used,” said Weld at the recent book launch at the Century Club in Manhattan. 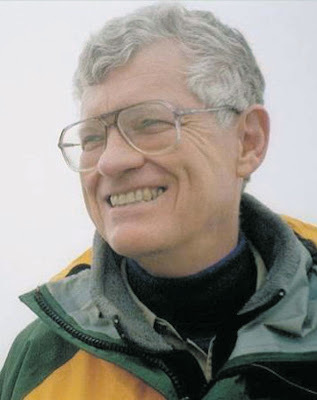 Author JOHN ROUSMANIERE had written 25 books before he was approached by Evergreens, including several histories of New York firms and the New York Yacht Club. In the introduction he writes how attached he has become to the cemetery and its history. Photographer KEN DRUSE, one of the leading horticultural photographers in the US, joined the project with enthusiasm. “I think he got so excited he forgot to bill us,” said Weld. As the author notes, the full story of Evergreens follows several threads, which he has sorted into four story lines: the people buried there, the people who created and maintain it, its physical space and architecture, and its rituals. Rousmaniere visited the cemetery each week during the first of three years of research and writing. He consulted the cemetery’s meeting minutes, scrupulously kept from the 1860s to 1910, and relied on the cemetery’s scrapbooks for further information. Living guidance came from cemetery historian and tour guide DONATO DADDARIO and Assistant Superintendent ANTHONY SALAMONE. Some of the most gripping stories of Evergreens are not those of famous or infamous names (such as the Tammany Hall crooks and a large number of men and women associated with President Lincoln’s assassination) but of the mass burial monuments created after tragic disasters involving wide spread loss of life, often with unidentified victims. On March 25, 1911, a fire erupted inside the locked doors of the Triangle Shirtwaist clothing factory high in a ten-story building in Greenwich Village. Within 20 minutes, 146 people, mostly Jewish immigrant women, were dead. For those victims whose remains were not claimed, an estimated 400,000 mourners attended the funeral, after which they were buried in several cemeteries. Those buried at Evergreens are watched over by a moving monument of a kneeling woman. Near by is a monument for 27 victims of a fire at a New York Mental Hospital at Ward’s Island, only one of which was identified, presided over by a spruce tree. In 1876, when a fire killed 278 men, women and children during the last act of The Two Orphans at Conway’s Brooklyn Theatre, it was Brooklyn’s worst fire disaster history in terms of fatalities and the second worst fire in American history. The unidentified dead were interred in Green-Wood, and more than two dozen identified victims were buried individually at Evergreens. (The burned theater later became the offices of the Brooklyn Eagle and later again became the site of a courthouse). 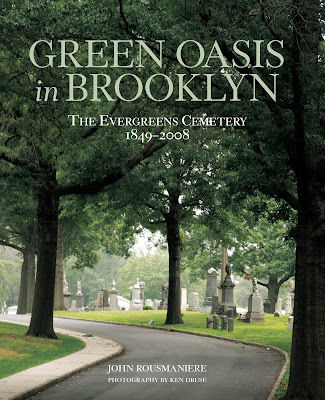 For more history, Green Oasis in Brooklyn: The Evergreens Cemetery 1849-2008 can be purchased at various outlets online.